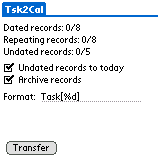 Tsk2Cal transfers all the completed tasks in Tasks to Calendar and sets private flags if needed. Undated tasks will be also moved to today if "Undated records to today" is checked. "Archive records" will archive transferred records to PC at the next sync. "Format" is a prefix to Calendar's description. You can include only one %d, which is priority, or no %d at all. Tsk2Cal searches for new PIM databases first and then starts to find old ones. Tsk2Cal is freeware, which means USE IT AT YOUR OWN RISK! Mon Apr 8 03:49:46 2019 . XHTML . CSS (lightbox.css is not part of Uniqki. ;-) . Powered by Uniqki!